Protect Yourself From Credit / Debit /ATM Card Fraud . Latest Educative Article on Credit / Debit /ATM Card Fraud phone call scams. According to the FTC (Federal Trade Commission), the total amount of credit card fraud worldwide, during year 2011 was a whopping ~US$5.5Billion. 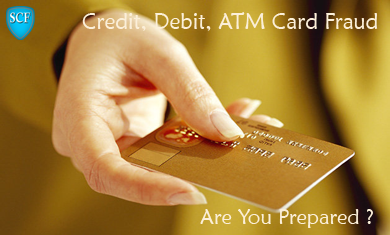 17% Americans experienced Credit Card & ATM fraud. In Australia, this was 25%; which meant every fourth person in the country, was subjected to card fraud. According to the UK Credit Card Association, 341 Million Euro was lost in fraud in 2011, on cards issued in UK alone. Obviously, Credit Card fraud is something that everyone of us need to seriously guard against. The extent of spread of card fraud points to an evident lack of alertness, rather than lack of knowledge about such fraud. There is a feeling of false pride (“No one gonna scam me!”) among lot of people and such complacency has been their undoing. Never allow your card to be charged over phone, whatever be the offer. Shop only at reputed websites with secure online payment. Ensure that your anti virus and anti malware softwares are active and up to date. Be alert about mails which could look deceptively similar to that from a bank or any website that you are familiar with. Never give in, to the pressure of “Account Cancellation”, “Account Verification” and such other emails. Take your time. Go to the actual website directly, by entering its URL to verify.